Welcome to December! I am Karen N and I live in the suburbs of Cape Town in South Africa. This month we are making a fairly simple star block. I am very glad that I had the last month of the year, although Nann’s block is a hard act to follow! 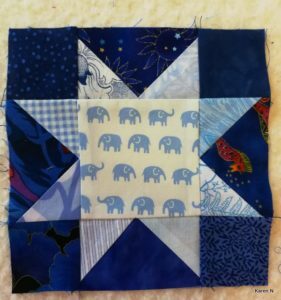 The block finishes at 6-inches square, in either scrappy blues or scrappy purples. You may make up to 9 blocks for the drawing. You will find the pdf pattern this link: Dec2018 Block Lotto Please use Scrappy Dec Stars as the tag for this month. Come back later in the month to see the list of participants and the number of blocks we’ve made. I made a number of these blocks some years ago, and now ca n’t quite find where the idea originated. 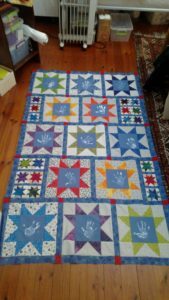 I used some in a school fundraising raffle quilt – the centres of the bigger blocks all have the handprints of preschoolers, and the 6-inch blocks were used as fillers. Karen, the link to the PDF comes up “not found.” Could you repost it? Thanks. Hi everyone, the link to the pdf has been updated. I think I “linked” it, instead of ïnserting” it. Thanks Nann! Thanks! I love blue (or purple, too), and I love Sawtooth Stars! It’s a win-win! 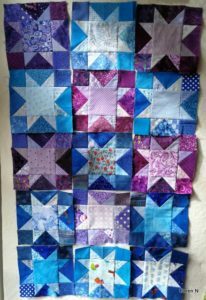 THis star block is one of my go-to blocks and I love the blue/purple colors you have chosen. Qjestion: Instructions read “You can repeat fabrics but not more than two in a block …” does this mean you can use 2 dark fabricstotal located scrappily aroung or symettrically the block and 3 lights center light #1 and star tips lights #2 & #3?)? Or only 2 pieces of the same dark favric and the other 6 have to each be yet different and likewise, only 2 star tips or a star tip and center being 1 light fabric and other 7 be all differnt from one another? I don’t have that many of either cooor .to do the blocks almost ALL scrappily. My apologies for all the typos — cataract surgery end of this month and maybe I can see the screen and the gray type better and correct when I type. In any case,there are 8 dark pieces and 9 light pieces. per block. Guess my question is how many minimum different fabrics of each light or dark are allowed? I see 2 different interpretations of the instructions. I do get the idea of “as scrappy as possible” but need to deteriine if I have enough differents or if I need to “buy, borrow, beg or steal” G! Hi Karen B. my plan was for you to use as many different fabrics as possible in each block, and to not repeat more than two pieces of the same fabric in a block. Fabrics may be repeated in different blocks. If you are a bit short, perhaps stretch it to using at least four diffeernt lights and four different darks. Karen N.
Thank you so much for the further clarification, Karen. Now I know the parameters within which I need to work. Don’t know why my mind kept thinking up different meanings for your original guidelines. Brain fog?